SCAM ALERT —– BUYERS BEWARE!!! Powder Valley Poodles wants to protect you against fraudulent scam artists preying on innocent consumers. PLEASE READ! Please be aware that not all websites you will find that sell puppies are real. There are many websites out there — some on the first pages of your search — that are complete scams. The people have stolen pictures, text and testimonials from reputable breeders (such as Powder Valley Poodles ) and put them together to form web sites that entice people to place deposits on puppies. They call themselves by the first names of the reputable breeders whose websites they are stealing. 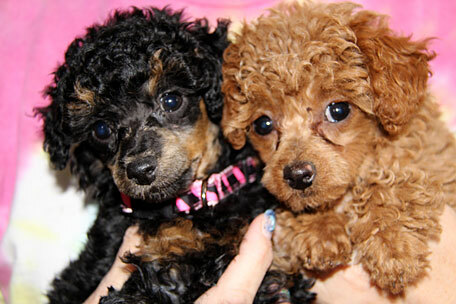 They may call themselves, “Terry and Carrie Poodles”, or, “Terry and Karen Poodles”. My Testimonials from my very happy poodle puppy and doodle puppy buyers appear ALL OVER the internet as testimonials within scam websites in order to convince people that they are dealing with a reputable breeder. But, there are no poodles. There are no puppies. They take your credit card information or money order and that is the end of their involvement with the client. These are not breeders. These are Cyber scam artists. How do you tell the difference between a real breeder and the con artists? The real breeders will have a physical address. An address that you can contact the post office in their town to see if the address is real and if the names they provide go with that address. Con artists typically have only a post office box. Con artists also typically will communicate only by texting or email. A genuine, reputable breeder wants to TALK to the people potentially buying a puppy. I won’t sell a puppy to someone based on texts or emails. Most reputable breeders are the same way. I want to make sure these people will provide a good home for my puppy. You just can’t get that via a text or an email. Also, con artists are frequently operating out of foreign countries. They may have a foreign email address and if you do speak with one they may have a foreign accent. So, you may see bits and pieces of my web site (and other reputable breeder’s web sites ) out there. Know that we do have the authorities working on stopping these criminals but it is difficult and for law enforcement a fairly low priority. Since I was first made aware of this problem over a year ago when one of my clients saw her testimonial to me on another web site there has been no progress in stopping the scams. So please, BE CAREFUL. Be CAUTIOUS. Be AWARE. Make sure the breeder you are contemplating has a REAL physical address and will speak to you by telephone. Ask MANY questions. Ask to VISIT the kennel. (even if it is many miles away — this may scare off a con artist) Contact the BBB in their town. Ask for the name, address and telephone number of the kennel’s veterinarian and make sure that it is REAL. Be a savvy consumer. Be safe. Be aware and insure that you are dealing with a reputable, and real, dog breeder. Our miniature, toy, and standard poodles are structurally correct, genetically superior and easily trained. 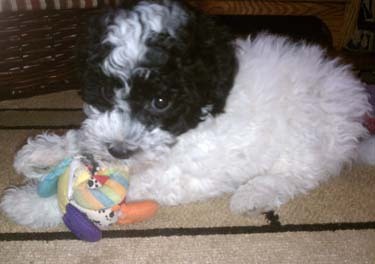 Powder Valley Poodles puppies are the very best dogs available. We guarantee it. Although you can pay a whole lot more for a puppy somewhere else, you simply will not find a better dog for your family. Our dogs are loyal, long-lived and people-oriented. They are playful, affectionate, and healthy. They are the perfect family dog, companion and Service Dog. Sometimes you have to wait a little longer to get one of our puppies because we tend to have fairly long waiting lists and early deposits. There is a reason for those long waiting lists. People recognize quality. We are not a large multi-dog kennel. Our dogs live in the house with us and our puppies are born in the house and generally are not outside unless we are outside with them. They are raised with other dogs, large and small, cats, and children. 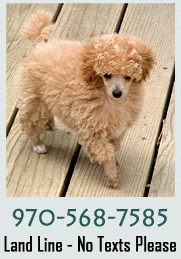 about Powder Valley Poodles of Wellington, CO!